Leadership in Energy and Environmental Design (LEED®) is a rating system developed by US Green Building Council (USGBC) to provide a definitive standard for what constitutes a green building in design, construction and operation. In Canada, the LEED® rating system is administered through an exclusive license agreement with the Canadian Green Building Council (CaGBC). The rating system in both countries is implemented using traditional design guidelines and a tool called the LEED® scorecard. LEED Canada - NC 1.1 (New Construction) consists of an explicit set of environmental criteria, organized into five performance categories: SS, WE, EA, MR, and EQ. A sixth catgeory (ID) rewards exemplary performance or innovation beyond the criteria in the previous categories. Each category consists of a collection of prerequisites and credits which are earned depending on the "greeness" of the project's design and construction. At the end of construction, the prerequisites and credits are documented and submitted to the Green Building Certification Institute (GBCI) for evaluation and final certification. 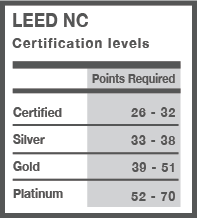 For LEED®-NC 1.1 projects in Canada, four certification levels are possible depending on the points earned. The Reliable Controls Headquarters building has been designed and constructed to meet LEED® Platinum, the highest level achievable. To understand how the Reliable Controls MACH-System aids in earning LEED points, Click here. Click on each of the six categories below to read the LEED® Description for each prerequisite and credit, and understand the details of the Reliable Controls Implementation that was completed in order to earn the LEED® Platinum Certification. This category evaluates the project with respect to innovative strategies implemented but not addressed by LEED, and exemplary performance achieved that are above the requirements set by LEED.